Cleaning a cooker is a chore and a bore, so don’t do it. 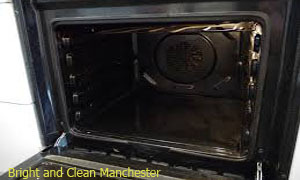 Hand the job over to a dedicated oven cleaning team in Manchester. Pay a surprisingly low price to spare yourself hours of scrubbing, stretching and grubbing around in corners. You’ll get a refreshed oven that’s free of grease and baked on carbon. Our cleaners get to parts of your oven you don’t generally reach and your work is completed using eco-friendly, non-toxic chemicals. They’re 100% safe and leave no unpleasant chemical taint. Use this service for your domestic or commercial cookers, we work with both private and business clients. Book cleaning for any sort of cooker: Single ovens, double ovens, ceramic hobs, Agas, ranges and grills. We’ll do your fridge or freezer too! 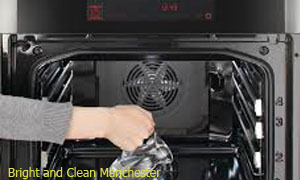 Delivering superior oven cleaning services means getting to as much of the cooker as possible. So the first thing your team will do is take your oven apart. Every rack, tray, control button, filter cover or light fitting that can be detached will be. Each component and the main body of the oven are deeply cleansed and scrubbed. The solvents used for your oven cleaning are low odour, so there’s no unpleasant smell attached to the cleaning process. This approach enables us to get to places that are otherwise inaccessible and lift baked on grease or fats along with harmful carbon. Once everything is cleaned your oven is reassembled, checked and polished. There’s no waiting or drying time involved. The moment our cleaners are done your oven will be ready for you to start cooking fresh tasting and wholesome food. Our oven cleaners are reference vetted before being accepted for employment. They’ll arrive to your home or business in uniform and carrying ID. So you’ll always know exactly who you’re letting into your property. Once the initial vetting process is complete, we provide specialist training and certification for our Manchester oven cleaning team. Your technicians know exactly how to get the most out of the products and equipment we supply them with. Finally, as you’d expect from a professional cleaning company, all of our services are covered by full insurance. We don’t anticipate a problem, in fact we’ve never had one yet…but just the same, you’re covered.